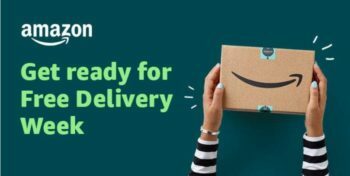 Free Amazon delivery for everyone – No Prime membership needed! Until 5th December everyone can get items delivered free of charged without the need of a Prime membership. You can order one or more items but in order to qualify for free delivery, items must be dispatched directly by Amazon and display Free Delivery next to the price. Use the promo code FREEDELIVERY at checkout! It will take 1-2 business days for your items to arrive after all items are ready to be dispatched. More info about Free Delivery Week is here here. If you want to benefit from free one day delivery on every order you can try Prime for free when you sign up here.